The AOC q2963Pm isn't the most attractive 29in monitor ever seen, but there's a lot to like about this ultra-wide display. Its industrial slab-like design is a world away from the sleek curves of the LG 29EA93, but this 2,560x1,080 IPS display is great for multitasking with lots of individual windows and lending a more cinematic feel to your films and games.Despite having a huge stand, the AOC q2963Pm is not height-adjustable, so it felt a little low on desk. You can't tilt the screen very far, either. Thankfully, its viewing angles are superb and we had to look at the display side on before we noticed any considerable shift in contrast. The AOC q2963Pm's huge stand accommodates three inputs in the form of DisplayPort, dual-link DVI-D and VGA connections. There's also a second DisplayPort located at the base of the stand. This is handy for daisy chaining other monitors. It has two 3.5mm audio jacks, one for input and one for output. Although the q2963Pm has a HDMI port, it's only for use with MHL-compatible phones and tablets. 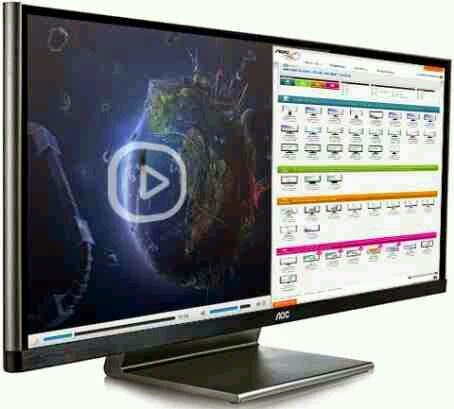 MHL is still novel, but we're seeing it on more and more monitors. It lets you display the content of your mobile device's screen on the q2963Pm, and charges the device at the same time. We tried the q2963Pm's MHL function with the HTC One X+. As with the LG 29EA93, the content of the phone's screen is displayed horizontally and is blown up to fill the majority of the screen. It doesn't look particularly good, though, as images have jagged edges and the q2963Pm's 21:9 aspect ratio stretches them. Thankfully, the q2963Pm lets you adjust the aspect ratio to 16:9, 16:10, 4:3 or 1:1, but images still looked jagged at an aspect ratio of 1:1. This is a fairly good selection of connections, but we'd prefer to have a proper HDMI input too, and we're a little disappointed that it doesn't have a USB hub. The q2963Pm also has a pair of speakers, but they produce very little bass, so you'd be better off using external speakers if you want to listen to music. The monitor's overall image quality was very impressive. The panel uses IPS technology and our colour calibrator showed it was displaying 98.9 per cent of the sRGB colour gamut at its default settings, with only a tiny weakness in its red coverage. This is an excellent score, particularly for an IPS display, and we even managed to increase it to a near-perfect 99.9 per cent coverage after calibration. This puts it on par with the Dell U2913WM, and it means the q2963Pm provides excellent colour accuracy. It certainly made a difference in our subjective image tests, with solid reds, greens and blues being just as bright and vibrant as on our reference monitor. Blacks were deep and true, which reflected our low black level reading of 0.32cd/m². Whites were a little grey, but everything was uniformly lit across the screen and there was no evidence of backlight bleeding. The only thing that lets the q2963Pm down is its slightly weak contrast levels. We recorded a contrast ratio of 655:1 before calibration, which is quite a lot lower than AOC's claimed figure of 1,000:1, and it affected our high contrast test images. It coped well with areas of detail in lighter parts of our photos, but darker areas were simply black. The q2963Pm's physical menu controls were also a little fiddly to use, but thankfully the monitor comes with AOC's i-Menu software. This lets you change the settings using your mouse and keyboard, and was much easier to use than the buttons on the side of the bezel. As the AOC q2963Pm is so wide, you can comfortably fit multiple windows in it. 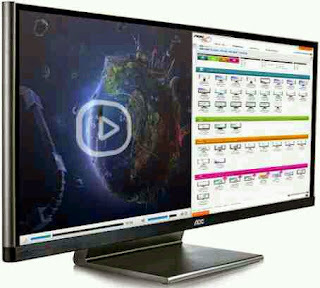 AOC provides its own software for dividing your screen space between programs, but it's not very easy to use. You have to drag windows onto a grid instead of configuring the screen how you want. We could only get it to recognise Windows Explorer windows. It wouldn't organise Word documents, web pages or our email client, so you'll be better off arranging them yourself. The AOC q2963Pm is a great monitor that's on par with the LG 29EA93 for colour accuracy, but it lags behind on contrast, making it less suitable for fine photo editing and watching films. It may be the cheapest 29in monitor we've seen so far, but its grey looks won't appeal to everyone and we'd rather spend extra money and buy the prettier LG 29EA93.